This article is about the bat enemy formerly called a Swooper. For the glider from Mario Kart 7, see Swooper (glider). Swoops, originally called Swoopers, are bats that first appeared in Super Mario World and since then, Swoops have become recurring enemies, appearing in several other games, including main-stream and spin-off ones. They typically hang idly on the ceiling, waiting for the player's character comes near, at which point they fall and fly towards the player, hurting the heroes on contact. In Super Mario World, Swoopers hang from the ceilings of caves upside down, waiting for Mario or Luigi to approach. When they come near, the Swoopers fly down and try to hurt Mario or Luigi. They can easily be defeated by with a stomp. They are mainly found in Vanilla Dome. This is the only game in which Swoopers are green. An unused variant exists that is the traditional blue color; it acts like the Boo clouds found in some Ghost Houses. However, the blue Swoopers have a glitchy animation (pictured below). 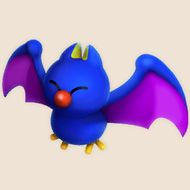 Swoops (called as such for the first time) also appear in Super Mario 64 and its DS remake. Found only in Hazy Maze Cave, these Swoops are recolored from green with reddish-brown wings to entirely blue with a darker shade of blue on the top half of the wings. Like in Super Mario World, they hang still on the ceiling waiting for Mario to come, then fall off the ceiling and flutter in place briefly before dashing towards its victim. In the original, they had pointed mouse-like faces with large rhombus-shaped ears and a visible tooth, as well as no feet; the remake featured the modern design, based off of the artwork for Super Mario World and the sprites for Paper Mario and Paper Mario: The Thousand-Year Door. Like in Super Mario 64, they hang on the ceiling waiting to attack. One appears in World 2-3, whereas the other twelve appear in World 5-2. They are blue and have purple wings. Their design in this game is extremely similar to their design in Paper Mario. Swoops appear in caves in New Super Mario Bros. Wii. They look just like their New Super Mario Bros. counterparts, and behave exactly the same. They appear in World 5-2, World 6-2 and World 6-6. In New Super Mario Bros. 2, Swoops appear in World 5- and in the third level of the Coin Challenge Pack B, behaving exactly as they did in previous games. Swoops reappear in New Super Mario Bros. U, behaving exactly as they did in the previous New Super Mario Bros. games. Their eyes also glow in the dark. They only appear in three levels: Perilous Pokey Cave, Light Blocks, Dark Tower, and Shifting Floor Cave. Swoops return in Super Mario Run, behaving exactly the same as in the previous titles. Their first appearance is in Treasure-Hoarding Swoops. A trio of Swoopers appear in Dinosaur Dilemma, living in the upper floor of an abandoned mansion. Upon spotting Mario, they attack him by dropping Koopa Shells. Depending on which page the reader chooses to turn to, Mario either avoids the Swoops and hides until they grow bored and leave, or one of their shells connects and knocks him out for several hours, allowing Bowser to conquer Dinosaur Island. Swoopers made their first appearance in the Paper Mario series in Paper Mario. They are found inside the Dry Dry Ruins, where they are either constantly flying or hanging on the ceiling. When they are hanging from the ceiling, Mario cannot reach them using a regular jump attack, and must instead use the Quake Hammer, Skolar's attack, an item, or one of his partners (such as Parakarry) to knock them off from the ceiling. They attack by simply swooping down and physically ramming their opponent. A stronger version of Swoopers exists, called Swoopulas. Swoopers also appeared uncommonly in Paper Mario: The Thousand-Year Door. Four Swoopers led by Sir Swoop make up the Glitz Pit team Wings of Night who appear during Chapter 3 to serve as a brief replacement for the KP Koopas after King K. "retires". Later on, in Chapter 4, Swoopers can be found in outside areas of Creepy Steeple. They attack like they did in Paper Mario. Additionally, Swoopulas return, and the Swampires also debut, which are even stronger than a Swoopula. Swoopers also re-appeared in Super Paper Mario. They are mainly found in Chapter 2 (Gloam Valley and Merlee's Mansion). Swoopers can be found in Gloam Valley in a secret area via using the Flip and falling into a 3D-accessible hole near the Star Block. Their Catch Card can be found here, along with the Shlurps' Catch Card. Swoopers are also found in the line-of-coins trap in Merlee's Mansion as well as a room in Merlee's basement. Swoops re-appear in Paper Mario: Sticker Star, for the Nintendo 3DS. They appear in the first section of Drybake Desert, inside the Yoshi Sphinx, and during Sandshifter Ruins. Despite how many enemies were redesigned in this game to look like their mainstream appearances, Swoops were kept purple for unknown reasons. In battle, they are always in mid-air and never hang from the ceiling but they are not common in fact they are a little rare and four of them only appear outside battle. They attack by swooping down at Mario. Swoops also make an appearance in the final battle, where they are summoned by Bowser. Swoops also assist Paragoombas, Paratroopas, and Spikes. Swoops return in Paper Mario: Color Splash, keeping their appearance and attack from the previous game, though their sprites lack the color gradients and the shading, the latter now being rather applied at the 3D models. They are found in Indigo Underground and Vortex Island. They can also assist the Big Spiny in Kiwano Temple in battle. Swoops appear first in Mario Kart DS, in the track Banshee Boardwalk, a retro course that first appeared in Mario Kart 64. Swoops, appearing in place of the original course's bats, fly in large flocks in the opposite direction of the racers. Though they are not a real hazard, Swoops can get in the way of any incoming karts, slowing them down. 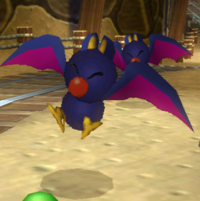 Unlike the bats in the original, Swoops appear in the course's time trial mode. Swoops also appear in Mario Kart Wii and act in the same way as in Mario Kart DS. They only appear in the courses Wario's Gold Mine and Dry Dry Ruins. Additionally, players can wipe out these bats by using certain items such as Shells, or under the power of a Star. Swoops reappear in Mario Kart 7 in the course Rock Rock Mountain. They behave the same way as in previous titles slowing down racers. There is also a glider that looks like a Swoop. Swoops appear as obstacles in Mario Kart 8 and Mario Kart 8 Deluxe during the cave portion of Mount Wario, N64 Yoshi Valley and Wii Wario's Gold Mine. In Hyrule Circuit, Swoops are replaced with Keese to fit with the theme of the course. In Mario vs. Donkey Kong 2: March of the Minis, Swoops do not appear on the ceiling, but instead flying around. They only appear in a boss fight against Donkey Kong, trying to attack the Mini Marios. The Swoops' artwork can be seen during the credits. Swoops make their first appearance in the Mario Party series as a cameo in Mario Party 8: they appear on the wrapper of the Vampire Candy. The Swoops appearing on the wrapper are blue, making them look like the Super Mario 64 and Mario vs. Donkey Kong 2 versions of Swoops. Swoops also have a minor appearance in Mario Party 9, flying around Boo's Horror Castle board. In the minigame Chain Event, several Swoops can be seen in the background as the player slides down the chain. Swoops appear in Mario Party: Island Tour on the Star-Crossed Skyway board. In the first and third stages, it gives out two Mini Stars. They also appear in the minigames Match Faker and Tap Dash. Swoops appear again in Mario Party 10 in multiple minigames. They appear in the minigame Pipe Sniper, and grant five points if hit. While regular Swoops are not present in Mario & Luigi: Paper Jam, Paper Swoops appear as enemies in the Twinsy Tropics Dungeon. Although they are absent from the original game, Swoops appear in Mario & Luigi: Bowser's Inside Story + Bowser Jr.'s Journey in the Bowser Jr.'s Journey mode as enemies and allies, thus marking their official Mario & Luigi series debut. They are flying troopers, and attack by charging into enemies. They are strong against Shroobs and Fawfulcopters. Their special skill is Discord which can lower enemy DEF. Tattle This is a Swooper, a ghost bat. Swoopers got their name because they swoop down out of the shadows. Max HP: 4, Attack Power: 2, Defense Power: 0 Even Jump attacks can't reach 'em when they're hanging on the ceiling, but earth tremors will knock 'em loose. Parakarry can also knock 'em loose with one of his moves. You can attack 'em however you choose once they're hovering in the air. Score 200 Items Card Type Common Card Location(s) Card Shop; Catch Card/SP; Chapter 2-1: Found in an underground area under the Star Block via a 3D-accessible hole. Card Description Swoopers aren't so bad, they're just lonely. Strangely, they greet visitors by snacking on their heads. ...This could explain why they have no friends. Quotes While flying low: "Swoop?" ~ "Swoop!" ~ "Swoooop..." ~ "Woops!" While flying high: "Try the hammer—I dare ya!" ~ "Nyah, nyah, you can't fly!" ~ "The higher I fly, the safer I am..." ~ "Fly hiiiiigh..."
Flying foes with noisy, flapping wings. "True to their namesake, these batty baddies swoop down from on high to cause mischief." Notebook bio: "This foe will swoop down from above. Stomping it can send you flying waaay up high!" They charge straight at enemies, even in the dark. The sound of their wings can weaken mechanical enemies, as well as certain other types. Basabasa Onomatopoeia for rustling; officially romanised as "Basa Basa"
In the Super Mario Mash-Up Pack in Minecraft, Bats are replaced by Swoops. This page was last edited on April 25, 2019, at 13:29.